Hi beauties. It has been a long time I have not done any product reviews. Today I want to do a review on my current favorite facial cleanser. If you look at my beauty profile, you will see that I'm a huge Dermalogica fan. 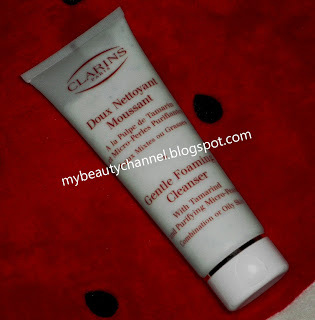 I never wanted to switch my facial cleanser but I was given a 20ml sample tube of Clarins Gentle Foaming Cleanser for combination and oily skin 4 months ago and I fell in love with it instantly. I'm on my second tube of this cleanser and here is the review to support my love for this cleanser. - economical, one tube of 125ml can last up to 2 months because only a pea-sized amount is required. Aqua, glycerin, stearic acid, myristic acid, potassium hydroxide, glycol distearate, lauric acid, sodium lauroyl sarcosinate, tipalaureth sulfate, aluminium starch octenylsuccinate, glyceryl behenate, ozokerite, parfum, dimethicone, mannitol, propylene glycol, cellulose, tetrasodium EDTA, alpha-glucan oligosaccharide, polymnia sonchifolia root juice, sodium salicylate, tartaric acid, maltodextrin, tamarindus indica extract, acrylates/ammonium methacrylate copolymer, triethyl citrate, gossypium herbaceum (cotton) seed extract, hydroxypropyl methycellulose, gypsophila paniculata root extract, lactobacillus, potassium sorbate, methylchloroisothiazolinone, methylisothiazolinone, sorbic acid, bht, benzyl salicylate, butylphenyl methylpropional, limonene, linalool, CI 77891 / titanium dioxide, CI 77007 / ultramarines. Would I buy again: Yes, yes and yes! What are my changes during and after pregnancy?